- 1st TAGA Awards 2005 of the Screen & Graphic Imaging Association, Bangkok. - 20th PTT Art Exhibition, Bangkok. - 27th Bualuang Art Exhibition of Bangkok Bank, Bangkok. - 7th Panasonic's Contemporary Art Exhibition, Bangkok. - 15th Toshiba's Art Exhibition of "Bring good things to life", Bangkok. 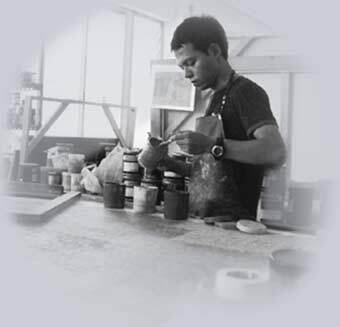 - 2nd Printmaking Exhibition of "Four Colours" Group at Chiangmai University Art Museum. - Second International Biennial of Mini - Prints - Tetovo Macedonia. - 19th Contemporary Art Exhibition of Young Artists, Bangkok. - 48th National Art Exhibition, Bangkok. - 14th Toshiba's Art Exhibition of "Bring good things to life", Bangkok. - 4th Panasonic's Contemporary Art Exhibition, Bangkok. - 17th Contemporary Art Exhibition of Young Artists, Bangkok. - 4th Ordinaries Group Art Exhibition at Faculty of Fine Arts, Gallery, Chiangmai University. - 1st Printmaking Exhibition of "Prints AS Prints" Group at Faculty of Fine Arts, Gallery, Chiangmai University. - 47th National Art Exhibition, Bangkok. - 2nd Nokia Art Exhibition, Bangkok. - 2nd Printmaking Exhibition of "Prints AS Prints" Group at Faculty of Fine Arts, Gallery, Chiangmai University. - 3rd International Mini - Prints Biennial CLUJ - NAPOPA, Romania 2001. - 3rd International Prints Art Festival GRAVURA EVORA, Portugal 2001. - 11th International Prints BIENNIAL VARNA 2001 Bulgaria. - 16th Contemporary Art Exhibition of Young Artists, Bangkok. - 3rd Ordinaries Group Art Exhibition at Faculty of Fine Arts, Gallery, Chiangmai University. - Mini Printmaking Exhibition at Kadsuankacw Gallery, Chiangmai. - Outstanding Prize of thing School and College Level. - 7th Toshiba's "Bring good things to life" Art Exhibition. - Supporting Prize, 18th Contemporary Youth Artists. - 2nd Prize (Contemporary Thai Painting), 25th Bualuang Art Exhibition. - Scholarship of Gen. Prcm Tinnasulanon's Artistic Creation Foundation. - 2nd Prize, Silver Medal Award, Graphic Art Section, 50th National Exhibition of Art, Bangkok. - Outstanding Prize, the 16th Toshiba's "Bring good things to life" Art Exhibition. - Outstanding Prize, the 1 st Samart Art Exhibition on the occasion of its Semicentennial anniversary. - Outstanding Prize/TAGA Awards 2005 of the Screen & Graphic Imaging Association. - The 1 st Prize, the 20th PTT Art Exhibition. - The 3rd Prize, the 27th Bualuang Exhibition of Paintings, under the patronage of Bangkok Bank. - Outstanding Prize, the 17th Toshiba's "Bring good things to life" Art Exhibition. - The 3rd Prize, the 7th Panasonic Contemporary Art Exhibition. - The 2nd Supporting Prize, the 51st National Exhibition of Art by Krungthai Bank.